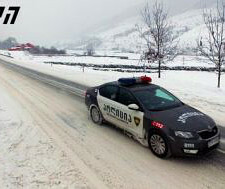 TBILISI, DFWatch–There are still road restrictions many places in Georgia due to the weather. Here is the latest update from the Road Department. 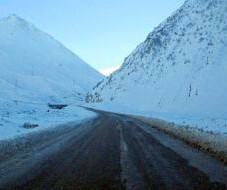 Trailers and semi-trailers are prohibited from driving on the Mleta-Kobi section of the S-3 road from Mtskheta to Larsi, the border crossing with Russia. Other types of vehicles are free to drive there. 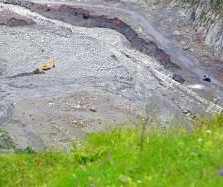 Police are out enforcing restrictions on the Alpana-Tsageri road from the 1km to the 22km mark and in the Nakerala pass between the 36km and 60km mark on the Sh-17 Kutaisi-Tkibuli-Ambrolauri road. Trailers, semi-trailers and vehicles with more than 30 seats are not allowed on these sections. Other vehicles must use snow chains because of icy conditions. Trailers, semi-trailers and vehicles with more than 30 seats are not allowed on the Khaishi-Ushguli 71km-188km section of the Sh-7 Zugdidi-Jvari-Mestia-Lasdili road. Other vehicles must use snow chains. The Road Department calls on people to use winter tires and follow the special restrictions that are in place on certain roads. A roads hotline is operated by the department: (+995) (0) 32 2 31 30 76.